One of my favorite Thai desserts. 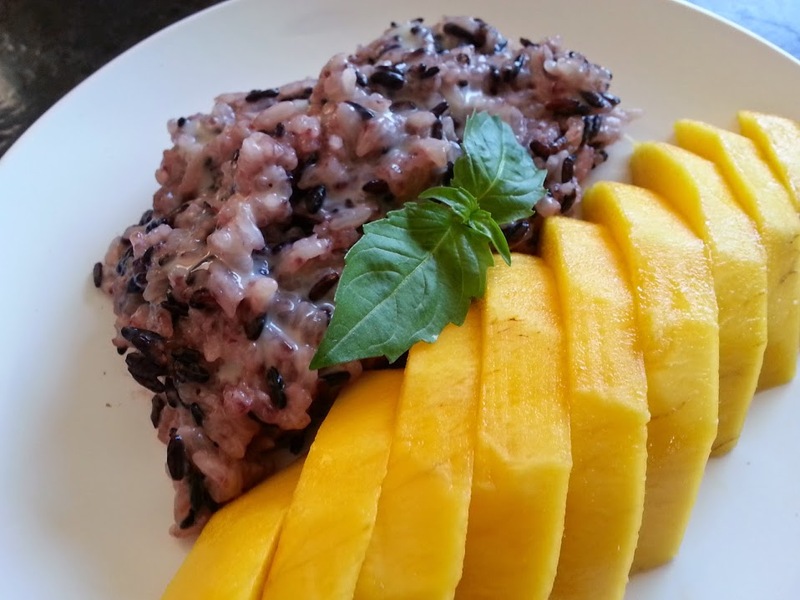 Try mixing white and black glutinous rice to give it a twist. 1. Soak glutinous rice separately for at least 8 hours or overnight. Mix glutinous rice and steam over a splatter screen covered with inverted mixing bowl for 10 minutes. Flip glutinous rice over and steam for another 10 minutes until rice is cooked. 2. While the rice cooks, mix together 1 1/2 cups coconut milk, 3/4 cup palm sugar, and 1/2 teaspoon salt in a saucepan over medium heat; bring to a boil; remove from heat and set aside. Reserve ¼ cup coconut milk mixture. Stir the rest into the cooked rice; cover. Allow to cool for 1 hour. 3. Make sauce by mixing together the reserved coconut milk and the tapioca starch in a saucepan; bring to a boil. 4. Place the sticky rice on a serving dish. Arrange the mangoes around the rice. Pour the sauce over the mangoes and rice. Sprinkle with sesame seeds.